The opponents of Supreme Court nominee Brett Kavanaugh want the FBI to engage in “an open-ended fishing expedition that, probably by design, would go on much longer than a week,” a pair of former Department of Justice officials said. 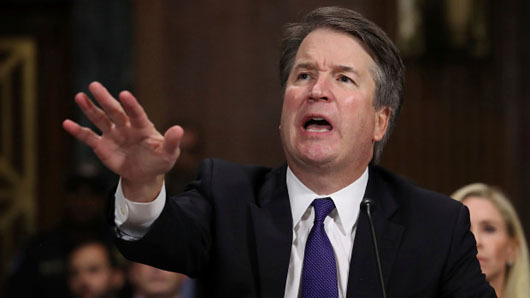 “They are insisting that the FBI investigate Judge Kavanaugh’s drinking while in high school and college and interview anyone who might know about it. Two such people have already come forward, and there are no disincentives for new claimants, possibly driven by partisan or personal animus, to emerge,” David B. Rivkin Jr. and Kristi Remington wrote for the Wall Street Journal on Oct. 1. Rivkin, who practices appellate and constitutional law in Washington, served in the DOJ and the White House Counsel’s Office during the Reagan and George H.W. Bush administrations. Remington served in the DOJ during George W. Bush administration and was responsible for overseeing the judicial nomination and confirmation process, including for Chief Justice John Roberts and Justice Samuel Alito. Soon after the FBI investigation into accusations against Kavanaugh was announced, Democrats “were challenging its credibility, objecting to its scope and focus, and lamenting that the White House had any involvement in shaping the process,” Rivkin and Remington wrote. Rivkin and Remington conclude that “Running a background investigation as if it were a criminal one would destroy the FBI’s ability to conduct the former. It would cause many Americans to refuse to cooperate. It would cause the bureau to exceed its constitutionally proper remit. And having the FBI proffer credibility determinations in the context of a judicial appointment would politicize the bureau – and, as then-Sen. Joe Biden correctly asserted during Justice Clarence Thomas’s 1991 confirmation hearings, it would usurp a function that properly belongs to the president and the Senate.